How does it feel when get inside? Sometimes have to pee, so slam the door, peel off rubber gloves that go “thwack,” and hustle to the bathroom with helmet, bag, and jacket All on. or no rubber gloves, just wooly sleeves. Wet, usually with some part not wet, like under arms and under upper legs. And then, what to remove next? To put socks and pants on rocks near heaters, start boiling tea water before stripping, to listen to a record in the meantime? It’s just so nice to vacate, evacuate. Don’t pee in rain-soaked clothes. Maybe comes call, or remember a date, a show, a party for someone. Make the tea, or pour the hot water and honey and lemon with whiskey. That’s nice. It’s dark at five thirty, morning or night. Doesn’t need checking, the window or web. It’s difficiculticult to solve for GOOSI. One reason is that when one is dryer, resting, little legs up reading and drinking h.t. is just what one needed, and finding friends, flirting, fighting, farting around feels funner. Also, it’s not going to stop, the dark and the water, and it’s not that cold, like Mall of Midwest America or Toronto tunnels. The bus is for suckers, and rides mean leaving with other people, or staying with other people, and that’s really what makes one stay home alone instead of venturing out in the first place. Evan Williams hot water and honey and lemon, responsibly, in an old honey jar. Flask: Or just like that, maybe. Flags along the route were not placed there to dissuade us, or turn us back. We see that the wind really is against us, the rain truly horizontal on cheeks, and we are not totally wimps, but it may still take us a while to arrive. The flags were waving against me, pointing like dogs with good posture. I curled up behind a fast stranger until she got annoyed and I lost her because she accelerated. It was really rainy in the eyes on the Oaks Bottom trail, but I think it was you, Miriam, whom I hadn’t seen in years. I promise, if I could have mustered any more than what I had just to keep up, I would have taken my turn in front. Sorry. Nice work turning on the jets and ditching me, though. That was actually so impressive and cool that it was kind of worth biking the last mile without your wind and rain cover. Got to try. And I honestly did, a few times on that path. It’s fun to meet a stranger and not even share eye contact, really, both with the headsets on, hustling to work, I assume, at that hour in that weather, and just trying to do what we can. When it’s raining and the flags are against one like that, it really helps to have a body in front. Those guys in the Tours are really onto something there. Helmet is easier to wear than listen to, no doubt. Some people don’t understand why carry helmet on bike sometimes. Is not look cool, is feel cool. In January, is feel wet, not cool, so helmet okay, not band. Kingfisher: can be seen from the Oaks bike path occasionally. So, two hours, a snack, some records, an h.t. later: reassemble. Form of... a water bicycle. Shape of... a kingfisher. Because those are some loud and wet birds with big heads like helmets. And it’s probably the name of some outdoor clothing adventurewear sportgear protectoshell wisking polyfibre company, or KINGfissure, right? Yeah, right? Okay, but some things work, like the plastic bag over the seat, and the books and letters inside plastic bags inside the waterproof bags made by bike messengers for bike messengers, which must explain why mine came with a gram of weed in the secret pocket and boyfriend/girlfriend who makes really good coffee! Thank you, I won’t be here all night I promise! Some people got that plastic bag over the shoe with rubber bands thing happening, and some got the mesh baseball cap brim under the helmet. I’m an Andy & Bax military surplus guy, myself, but I get it. Work it. In the bathroom of Community College’s Rock Creek Campus, I found plastic protective eyewear. There’s a welding and electronic lasery sort of program there. I don’t know. I took them home, which I probably shouldn’t have done, because I lose and find things all the time, and it’s probably why those few lousy things that have happened to me have happened to me. I can recommend them, however. The clear plastic safety glasses, not the lousy things. Clear plastic eyewear is nice in the haily rain. Leaves: I sound like a faux know-it-all, but autumn is fall. so pretty much just accept that some time over those weeks relative to this statement, you will fall. Mostly: Misty. Lee has lived in Oregon her whole life, and she says, “If you don’t like this kind of rain, wait ten minutes.” A quick quip requiring qualitative quaknowledge of the quaclimate, and perhaps also explaining the coffee and cigarette (ten minute) culture of this geography. I unlock my bike quickly, attach my lights, and I’m on it before she gives a final wave from behind the steering wheel. I bike a few blocks toward home, then lock up under an awning for another drink while the worst of the storm passes. When I leave the next place, I’ve either cleared my head of our conversation, or I haven’t. The rain is mild now, just the usual steady drizzle. Oh, great myth! 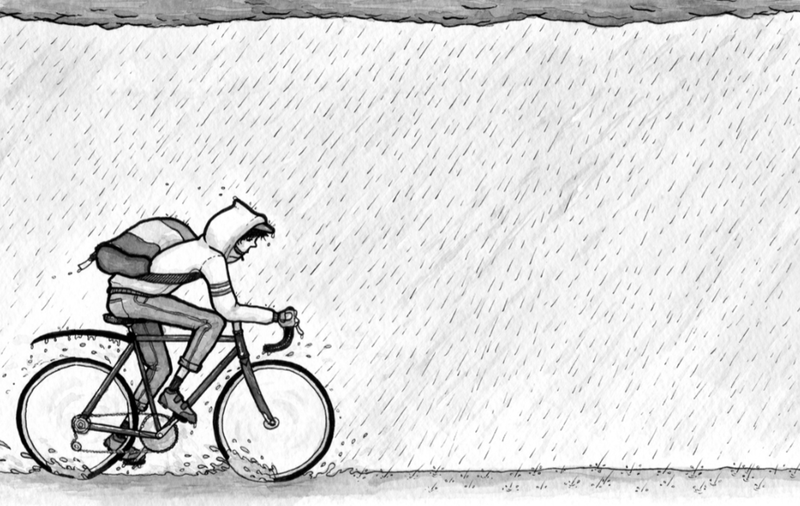 : We not have fifty-five words for biking in rain, but here are five: obdurate, obeisance, operose, osculable, occasioned. Personally: Bicycling in the rain makes me feel clean, but that may not be technologically confirmable. Quell what little fear you have, for your souls’ sakes because gripping the handlebars tighter does not help, nay, nor pressing the sole of the foot down harder into the pedal, for it is in the basket as far as it will go. No thing will help. Have you lights? Look you for the cement on the first rain of the year? Know you that this strange people forgets every year how to drive in rain, though they have lived with same for nine months a year for as long as there hath been good coffee and fancy beer? Even I, yes, admit to going slower, taking wider turns, and being shocked that first time when I grip my right hand and absolutely nothing happens. The bike just keeps going. It’s a nice feeling, like fate, or Maker’s Mark h.t. Rain: From which return. Home or wherever again. And strip, and hang, and pee, and know what will be worn tomorrow.